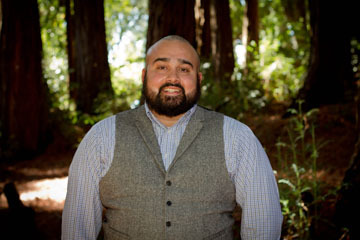 Brian Ragunan, coordinator for Veterans Education Team Support (VETS), the veteran outreach service at STARS, enjoys watching veteran students thrive at UC Santa Cruz. Ragunan served in the Marines in Iraq and Afghanistan. For Christian Kempis, now in the Navy Reserves, mentor work is a way to give back to others in the midst of transitioning to civilian life. To a small but tightly knit contingent of UC Santa Cruz students, Veterans Day is more than just a day off to hit the beach and grill some steaks. It’s also a time to celebrate identity, shared experiences, service to country, and pride for UC Santa Cruz’s 143 military veterans. Christian Kempis (Merrill ’17, computer science), a Navy veteran, sees Veterans Day as a chance to “plant the seeds of community” among student veterans, not just at UC Santa Cruz but also in the surrounding area. That’s why he plans to go to a barbecue at Cabrillo College that will unite UC Santa Cruz and community college student veterans. 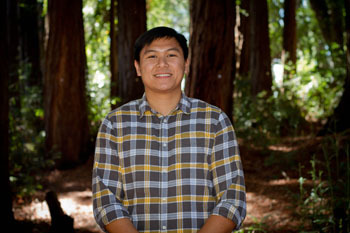 Kempis is a lead peer mentor for STARS, the popular acronym for Services for Transfer and Re-Entry Students, which provides support for students transferring to UC Santa Cruz after time at another college, or returning to or beginning their undergraduate education after years in the working world. STARS goes out of its way to welcome students who are military veterans, offering drop-in appointments that help veterans make their way at UC Santa Cruz and find the services they need, as well as organizing get-togethers. Peer mentors help veterans answer questions regarding their benefits such as the GI Bill. They also answer questions regarding class registration and campus life. But it wasn’t always easy to adjust to college life. “It was a little bit daunting, coming off active duty and work, and the age and mentality difference,” he said. Veteran’s support at STARS helped him get housing and work out a few kinks in his first year. Though he found it a challenge to ease into the fabric of UC Santa Cruz, his conversations with students about his military service were upbeat, he said. “A lot of students are genuinely surprised that we have a small population of reservists at UC Santa Cruz,” said Kempis, who is now in the Navy Reserve. “But they are surprised in a positive way. I’ve never run into any backlash. People understand where we come from. “From my perspective, we (veterans) add a lot to the campus,” he continued. “We bring a lot, not just because of our experience but because of our more firm resolve, and a bit of that leadership component. A lot of students haven’t necessarily learned that yet. When you’ve made it this far and are going to school, you’re a bit more of a hard charger” when it comes to studies and deadlines. Veteran students also add diversity to campus, said Brian Ragunan, coordinator for Veterans Education Team Support (VETS), the veteran outreach service at STARS. Ragunan served in the Marines in Iraq and Afghanistan. “I really enjoy watching veterans do well and supersede the stereotypes,” he said. “They bring so much. Some of them have been managers and leaders and traveled all over the world. They are diverse racially, ethnically, and in terms of sexual preference and political views. We have veteran students who have served in Afghanistan, in Iraq, in Vietnam." For Ragunan, Veterans Day is a reminder of the strength and resiliency of the veteran community. "It is a day to be thankful of all of the good things the country and my military career gave me as well as to be grateful to be alive and appreciative of that simple fact," he said. With help from people like Ragunan and Kempis, the campus has become an essential stepping stone in the veterans’ lives as they transition from military service into civilian life. Veteran students receive priority housing and class enrollment at UC Santa Cruz. 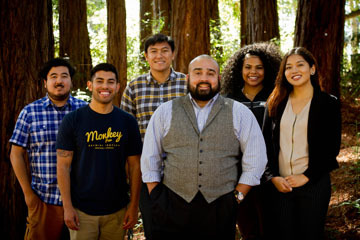 They can also take advantage of the resources at VETS, a home base for vets that includes drop-ins, peer mentoring, academic advising, and a newsletter..
Veterans also benefit from the generosity of former UC Santa Cruz staff members who want to help them thrive. A few years ago, the 200-member Retirees Association, made up mostly of retired staffers, created the UCSC Retirees Association Bruce Lane Memorial Scholarship. The scholarship commemorates and honors Bruce Lane, a staff member from 1964 to 1991. He was hired as a project architect and was involved with the planning and construction of many key buildings on campus. Lane was an officer in the Army Reserves for 35 years, and strongly endorsed supporting current UC Santa Cruz student veterans. He died in 2008. Those who wish to contribute to the scholarship may do so by visiting the UCSC Retirees Association scholarship page.